When I first moved to Florida, I drove a rust-bucket Jeep Cherokee I affectionally called: The Heap. I loved that car so much I wasn't even bothered that the A/C didn't work. Sure it's hot in Florida, but that's what car windows are for, right? One day I came up to a busy intersection with shops on four sides and multiple turn lanes in all directions. I had a choice to stop short of the car in front of me and leave a space for oncoming traffic to turn left, or I could squeeze up tight and block their path. I chose to stop and leave the path open; far be it from me to create a worse log-jam at an already convoluted intersection. Suddenly, from out of nowhere, a huge, black Mercedes illegally crossed three lanes to jump in front of me. I couldn't believe it! How arrogant! He blocked the space where others could turn left, just to jump ahead in line. Why couldn't the driver wait (like me) until the light changed? Who was he? Just because he drove an expensive car didn't give him the right to violate traffic rules. I guess he thought he was better than I...or at least my car. Well, I figured I'd show him. The Heap might've been ugly, but it had a fine, big engine and it loved to go fast. When the light changed and we both turned left on the highway headed back to the barrier island, I gunned the engine and sped around him. Yeh, definitely not my finest moment, but it is what I did. We raced onward, one darting in front of the other, changing lanes and trying to move ahead. I was determined to stay in the lead and block him from cutting in front of me again. I'd show him! 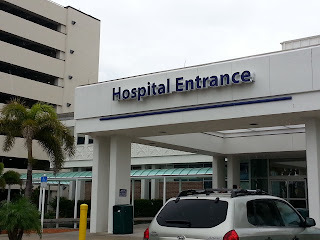 Suddenly, he burst through an opening in traffic, swung around my right and immediately cut in front of me across three lanes into a left turn lane...into the hospital. Uuunnnggghhhh! What had I done?! Was he a doctor, called for emergency surgery? A family member, summoned unexpectedly to the bedside of a loved one? A husband whose wife just went into labor? There are no words to describe how I felt. My actions were based on incorrect assumptions. I had a preconception about a driver and his behavior. I had personally observed the facts but I didn't have the complete context. Consequently, my conclusions were wrong. How many times had I done that?! 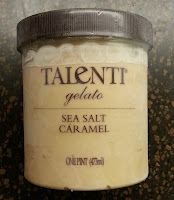 A less dramatic example was my preconception about Sea Salt Caramel ice cream. My friend showed me the container and said "This stuff is addictive! It is so good, you can't resist!" I wrinkled my face and made some remark about the twisted mind who had ever put salt on caramel, and assured my friend that I wouldn't like it. Well, I am literally eating my words! Do not try this ice cream unless you are prepared to be addicted! Preconceptions aside, salt and caramel work together like the A-Team. It is so good, I have to eat it with an espresso spoon to make it last longer! True confessions. So, have you ever had a situation about which you formed an opinion that was later disproved? Maybe you were dreading a get-together and it ended up being the best time of your life. Or you were certain you wouldn't like an item on the menu but were surprised when you had a taste. What was it like? How did it feel? I invite you to consider one of your past preconceptions and depict your experience in an art quilt. The orientation for this piece is landscape: 24" W by 18" H.
My, my.... you all certainly think up some interesting challenges! I always enjoy seeing the results and can't wait to see what you all come up with for this one. Thanks Martha! I have no idea what I will do, but I couldn't get this story out of my mind...I too, am eager to see the results of this challenge. Thanks for following! This is going to be an interesting challenge, Lisa-Marie. I've been considering the things I had preconceived ideas about and, ironically, what comes to mind is mostly things I thought were going to be better than they were......does that mean I'm an optimist or just have poor judgement? I'll have to give this some thought! Hi Lisa-Marie, you described one of my pet peeves - I can't tell you how my times I've yelled at other drivers from the closed, soundproof inside of my own car (real effective, huh?) It got to the point where the kids and I have a term we call "Car words". I'll let you guess what those might be. Of course, usually a few minutes after my rant I feel stupid for getting so mad. Lol Kate! I have definitely used "car words" and it wasn't in my "inside voice" either. Thank you, Lisa-Marie. This is truly an interesting challenge! There are many similar situations happen in our daily lives. This challenge reminds me to think in different ways and I believe it will give me a brand new inspiration! I can’t wait to see the result of everyone! Thank you Hsin-Chen. I, too, have to remind myself to think in different ways. I'm not sure how I will represent this challenge in fabric, but I'm excited to try. Oh Del! I was just the same: forewarned but curious. This is one occasion where I am happy to be proven wrong. Eating my words never tasted so good! :) My local grocery store carries at least 10 Talenti flavors and they often have buy-one-get-one free specials. I have to totally avoid the Ice Cream aisle or I would buy them out. I also love the coffee chocolate chip and my husband adores the pistachio. Happy travels and have a great, ice cream enhanced summer!